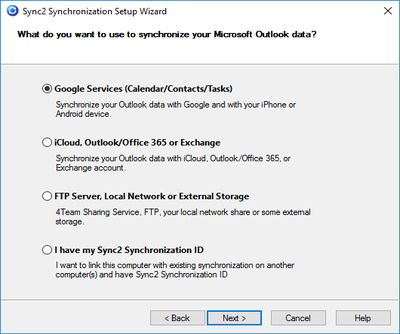 Sync2 Google Outlook synchronization wizard will make syncing setup very simple. Launch Sync2 on a computer where Outlook needs to be synchronized, enter your Google Account information and in a few moments your Google account will be synchronized with Outlook. Sync2 is an advanced alternative to Google Apps Sync for Microsoft Outlook and it allows you to use Microsoft Outlook 2003, 2007, 2010, 2013 and 2016 with Google Apps. Sync Outlook Calendar, Contacts and Tasks with Google Calendar, Contacts and Tasks. You can see and manage your Google Calendar in Outlook. Synchronize multiple Google accounts with Microsoft Outlook. Merge Calendars or synchronize each Google Calendar with selected Outlook Calendar. One or Two-way synchronization between your Outlook Calendar, Contacts and Tasks and Google Calendar, Contacts and Tasks. Click “Finish” to start synchronization immediately or configure advanced synchronization settings. Just in a few moments your data will be synchronized. How to synchronize Outlook calendar and contacts with iPhone? Thousands of customers worldwide trust Sync2 Google-Outlook synchronization software.